We bring to you a special collaborative piece on plastic free lifestyle by UrbanMeister and fellow green living blogger & social entrepreneur Cheri Newcomb. 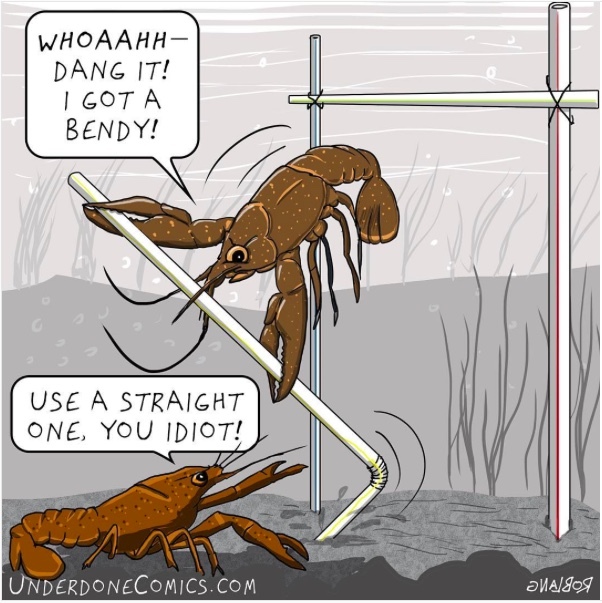 Owner of StrawSleeves, Cheri interviews celebrated cartoonist Rob Lang who has given love of nature and environment activism a cutting edge humorous voice in his cartoon series Underdone Comics. UrbanMeisters is a community of 30.000 smart urbans who are sharing their knowledge on sustainable living. Because of this vibrant exchange we have been able to share with you breakthrough sustainable innovations, stories, products, tips and ideas on green living. And today our feature is a celebration of this productive community where we’re not only sharing eco-friendly living advice but also professional milestones in the sustainability space. 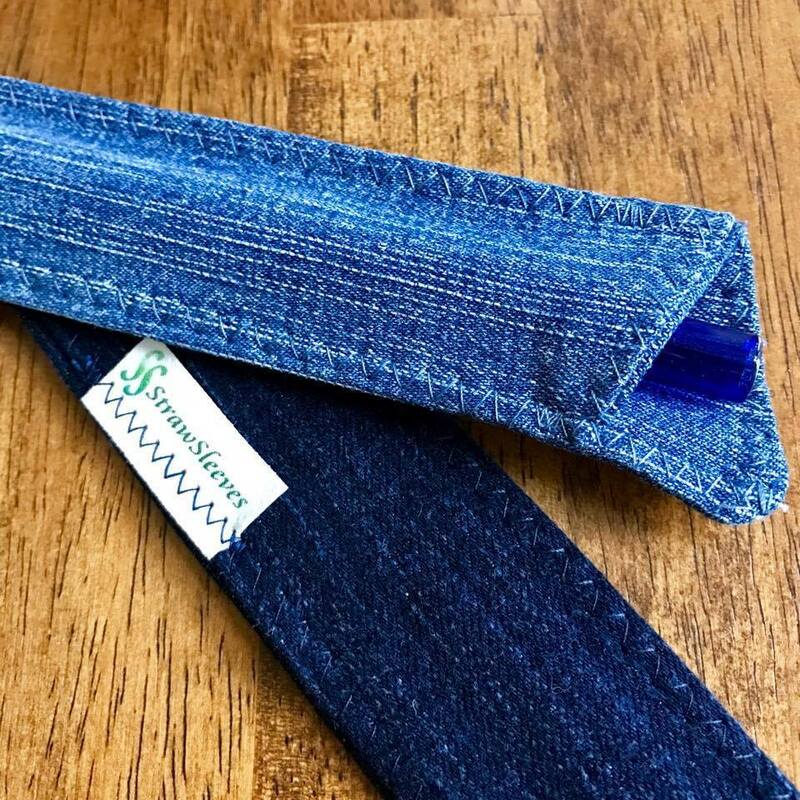 Cheri Newcomb is an enterprising green living enthusiast who has founded StrawSleeves- a fabulous product that provides a practical way to carry reusable straws while traveling, shopping, or eating out to aid going plastic free as much as possible. 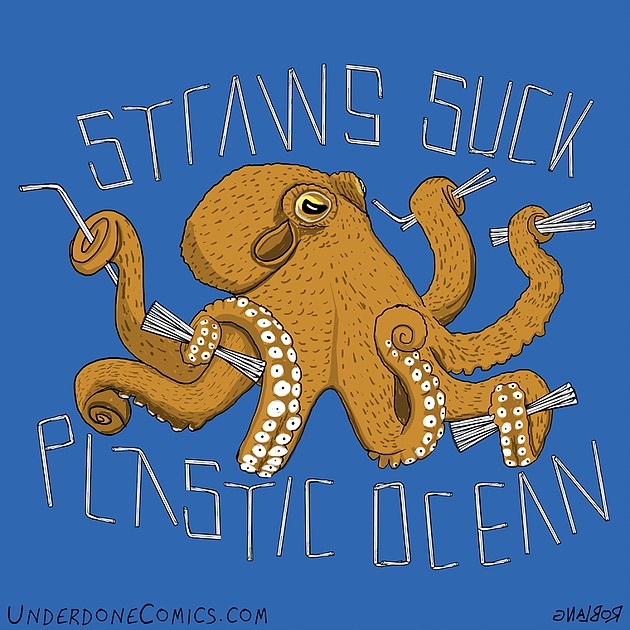 StrawSleeves is also an informative blog on everything wrong with plastic! Cheri is also an avid UrbanMeisters.com reader and we’re excited to publish her interview with Cartoonist Rob Lang of Underdone Comics. Cheri Newcomb founded StrawSleeves to advance the “bring your own straw” movement because single use plastic is a big environment problem and plastic straws are a big part of this menace. UrbanMeisters has been a vociferous supporter of plastic free lifestyle especially single use plastic like straws. Founder Mirela Orlovic has even given a comprehensive and easy to follow 4 tip guide on how to lead a plastic free lifestyle. And we found a kindred soul in fellow greenie Cheri Newcomb who focuses on finding solutions to the global single use plastic problem particularly plastic straws. UrbanMeisters has featured Bali-Boo Bamboo Straws earlier- 100% natural and sustainable alternative to plastic straws that you can buy below. You can start the plastic free life by taking a pledge to say no to using plastic straws with the #1LessStraw campaign by dynamic duo Olivia and Carter. 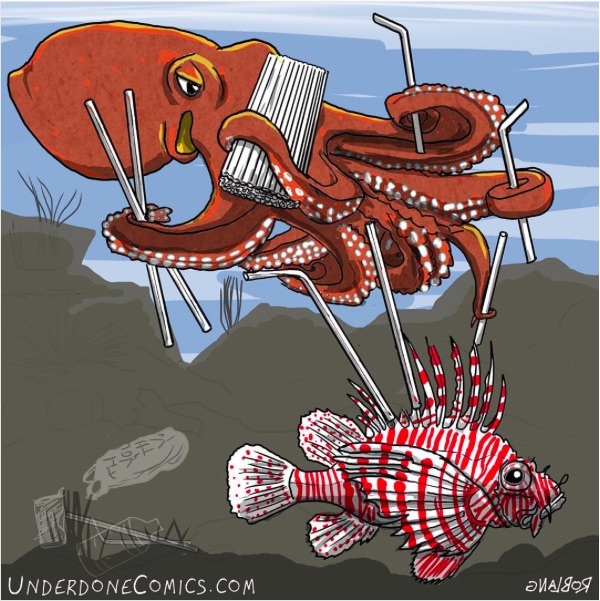 Giving love for nature and environment issues a homourous punch is cartoonist Rob Lang who’s comic series Underdone Comics. The daily comic series is a delight for all greenies and urbans! Nothing drives home a point quite like humour is what Rob believes and we completely concur! Here Cheri Newcomb interview Rob to find out more about his environmental inspirations, the plastic free lifestyle message and what drives his love for nature and humour. Over to Cheri! Hello Rob, I am excited to have our audience connect with your work. How long have you been a cartoonist? I have been a cartoonist as long as I can remember. I’m not even sure if I ever had any natural talent, but know I’m well practiced, mainly from so many years of doodling in school! What inspired you to turn towards environmental concerns? It’s a bit of a long story, but here goes: Around 2005, I was running my own business making websites and doing graphic and print design. All the while doodling just like I used to in school. While trucking along as a graphic/web designer, I figured I should be doing more with myself, like coming up with my own work and making a living at it. In the early 2000s, I got a handful of educational books published that are sold directly to schools’ reading programs. I began researching how to become a cartoonist. I don’t remember when, but at some point, I realized that writing a comic strip would combine both writing and illustration. I read that people like comic strips with recurring characters, so I decided to focus making a daily comic which included relatable characters. One day when our daughter was about 4 years old, she stumbled upon my comic strip. I read them to her and she was cracking up, laughing. Once again, I was bitten by the cartoonist bug! I decided to make 100 comic strips, call it “Underdone” (mainly because the animals in it—especially the pig—were thought of as nothing more than food by the people around him, especially his boss). I was sure to make at least one “quippy doodle” a day and post it on Instagram. Before long, I grew tired of the “situational comedy” of every day life and wanted to make a difference with my cartoons. Therefore, on Jan 1, 2016, I posted my first comic in a new direction. I finally felt like I was expressing my true voice! That voice, of course, being for the natural world. How did you zero in on straws for some of your work? What are your hopes of where your work is reaching? 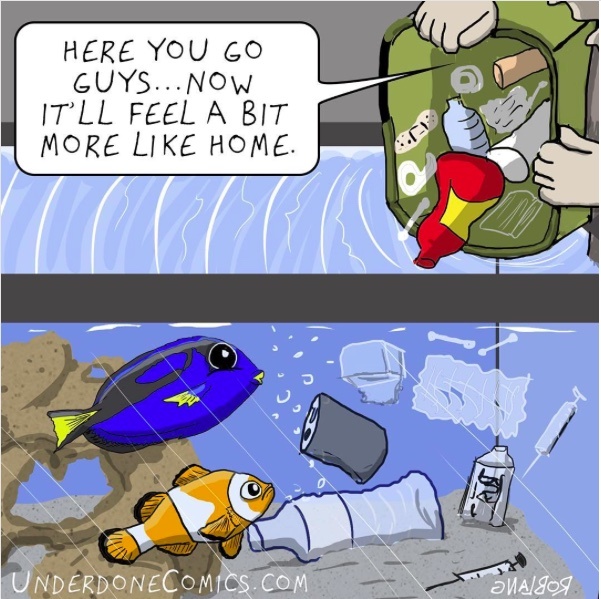 I really want to try to get people to think twice about what they are doing, like instead of grabbing a Ziploc bag, or before their urge to litter. Every action we do has an affect on the world around us! I want people to try to think about making the world better for everybody, not just animals. Most people are not hoarders; they care about whether or not there is trash all over their house. Why wouldn’t they extend that to the world outside their domiciles? By providing a thoughtful comic a few times a week, I am just hoping to get people to think about the choices they make. What is your hope for our environment in general? As a kid I spent a lot of time outside, there’s a big park behind my parents’ house in Pennsylvania and to this day, I still go outside for inspiration. I also spent a ton of time watching nature shows. I remember getting bored at the end of each episode when as they would start talking about conservation. The first 3/4 of the show would display animal behavior and all the good stuff. Then at the end was the boring stuff. Now I am trying to make a career out of making that boring stuff hit home, hopefully with a humorous twist to make it more digestible! Some people say science is the answer, so you don’t worry very much about the environment. However, I think that science is telling us to stop being such slobs. Sure, eventually science may help us fix things (for instance, the ozone layer seems to be getting better, but that is because we stopped using so much CFCs). If we can change our wasteful culture then I will have hope. In Seattle, we compost our food and yard waste. I’m so used to doing this that when I visit other cities that don’t, I see their trash and smell it and think about how much of that garbage could be made into soil. Instead, it just sits in a landfill for seagulls to get sick on. Barf! I have little faith in adults making a difference. People get stuck in their ways and think, “why should I have to do this?” My answer is, you should have to clean up for yourself because there are people who will have to suffer because you didn’t! You’ve made more than 300 comics since the beginning of 2016—that’s a lot to digest at once. I know you can see them all on Instagram and Facebook, but is there anywhere else you could get a taste? Earlier this year I became a contributor to (the producer of A Plastic Ocean and former Nat Geo Films CEO) Adam Leipzig’s Cultural Weekly magazine, which gives me a chance to put up a few comics a week on a certain subject. Before being a contributor, I feel like most of the cartoons I made over the year just fade away. Now, I am finally finding new ways to show them off! 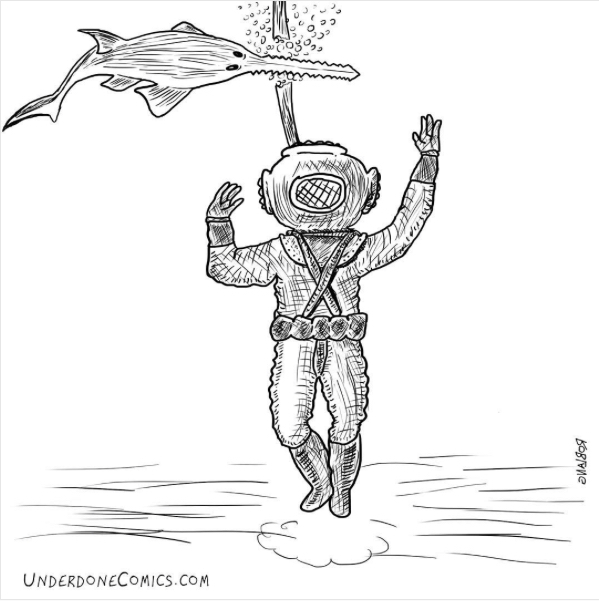 You can visit Rob Lang’s website – http://underdonecomics.com/shop/ or contact him on rob@underdonecomics.com. Also follow him on Instagram and Tumbler with handle @underdonecomics. You can also read this full interview conducted by Cheri Newcomb here. 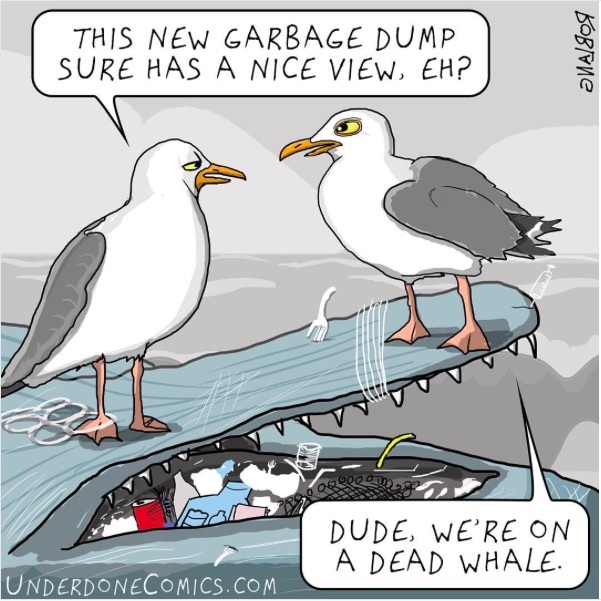 We at UrbanMeisters feel strongly about giving a powerful voice to green concerns and nothing hits harder than humour! 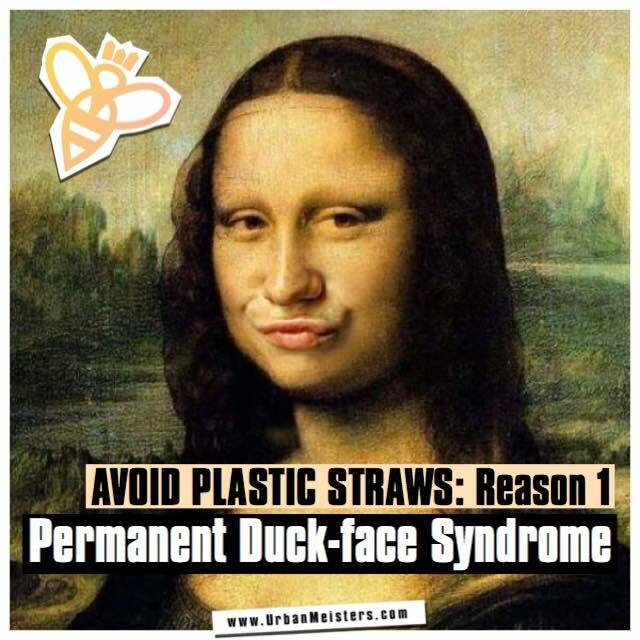 Giving plastic straw menace our own humorous take was our feature on 10 reasons to quit the plastic straw. If you have more suggestions on how to go plastic free or other green living ideas then reach out to us on contact@urbanmeisters.com or post your tip on social media with #GreeningIsWinning & tag @urbanmeisters (on Facebook, Instagram & Twitter). Let’s share our green living hacks.